Wow, my last blog post was Dec 10th. So much fun s tuff going on. Well, we did our favorite holiday trek once again, but this time it was a full 2 weeks. Mel was able to coerce Flash in taking more time off this year. We were in San Jose Dec 19 – 24. What a great time. I love the fact that the kids outnumber the adults. And all the cousins are in the same age range. Young, fun, loud and crazy. Grandma Gordon hosted one amazing evening for the Gordon family. And of course we can’t forget Papa Smith and the other side of the family. We had an amazing feast at Bucca di Peppo. WE WOKE UP CHRISTMAS MORNING TO SNOW. 5 inches in the valley. This brought tears to my eyes as I fled out the back door with Kaya at 8am. What a site. Kaya in the snow. Flash and I went snowshoeing in Tahoe and hung with the family. 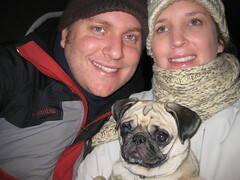 We headed out to Mammoth Dec 29th. Tuesday was followed by a quick day of snowboarding for Flash, when he bailed. Dislocated his shoulder on the 3rd run. IT SUCKED, but in his defense it was pretty ‘radical tumble’. He was a trooper and decided to stay till Jan 2ns. Flash is THE most amazing husband. He looked at me after picking him up from the ER, “babe, it’s only 1pm, you should go back up to the mountain.” And that’s exactly what I did. I went snowboarding the next day too! Love you all and can’t wait till next holiday season. This entry was posted in Fun, Travel and tagged 2008, holiday, mammoth, reno, San Jose by Melani. Bookmark the permalink.